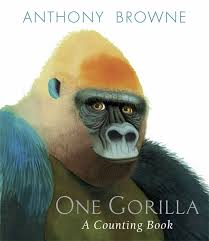 One Gorilla A Counting Book, written and illustrated by Anthony Browne. Candlewick Press, Somerville, MA, 2013. Every page that increases the number of primates is a riot of color. The mixed media illustrations, portraying our ancestral cousins, jump off the page. Lest you think the story is over when you get to ten lemurs, turn the page to discover a self-portrait of the author. “All primates. All one family. All my family..” the text reads. Turn one more page and there is our “rainbow race,” a group picture of folks from all over the world. Now look closer. Go back to the previous pages and see if you can match up the human faces with our lesser cousins. This is, quite simply, one of the most intriguing and beautiful counting books I’ve seen. We’ve got to get this one! One of Oskar’s words is gorilla. You’d think he’d pick dog or kitty. No, his only animal word is gorilla! My daughter got this copy at Frugal Muse at a discount price. I was surprised because it’s a fairly new book. Thanks for the comment!